Natural Rapids charcoal clay face mask allows users to improve their skin quickly and easily. People often buy face masks to remove impurities, clear up the skin, and help make the skin look younger. Natural Rapids has recently released their all natural clay and charcoal face mask that will help remove blackheads, prevent acne, and minimize pores. The problem many face mask users face is that there are hundreds of beauty products to choose from. Moreover, many of the products on store shelves and online are filled with artificial and synthetic ingredients that can damage the body. For this reason, natural products have been rising in popularity across the globe. Natural and organic skin care products can often do a better job than their synthetic alternatives, without doing damage to the body. Today, many face masks contain one of two “super ingredients” that help cleanse the skin of impurities. These two ingredients are activated charcoal and bentonite clay. However, many face masks often combine these all-star ingredients with artificial ingredients that can damage the skin. Natural Rapids has taken a different approach. The Natural Rapids charcoal clay face mask combines the power of activated charcoal and bentonite clay in an all-natural charcoal clay face mask that does wonders for the skin. The all natural and effective ingredients of this face mask are what set it apart from other products. Unlike many other face masks on the markets today, this mask contains no artificial or synthetic ingredients,. After only a few weeks, the Natural Rapids charcoal clay face mask has become a best seller and a favorite amongst Amazon customers. Customers raved about the product and reported that they loved how their skin glowed after using it. “We’ve always loved how well bentonite clay and activated charcoal work on the skin, but we’ve been disappointed to see how many products contain harmful additives like industrial glue that outweigh the benefits of these ingredients,” said Bruce Stevenson, co-founder of Natural Rapids. “We created this 100% natural and organic Healing Clay Charcoal Face Mask so that people can experience the amazing results without putting chemicals and artificial ingredients on their faces.” This mask is sulfate free, paraben free, and cruelty-free. The mask can be applied to different parts of the body such as the face, back or chest. Customers love that the mask is highly effective for preventing and eliminating acne and controlling blackheads. 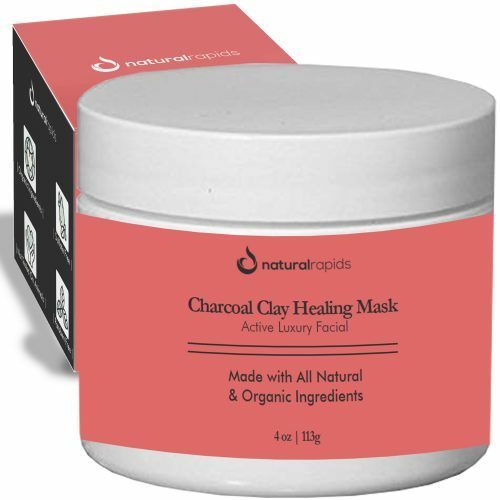 The Natural Rapids Healing Clay Charcoal Face Mask is available on Amazon, to get yours now, visit: https://www.amazon.com/Healing-Clay-Charcoal-Face-Mask/dp/B07FCT1J2C.